WinSnap v2.0.3 is the first digitally signed release. A valid digital signature helps to tell you the identity of the publisher (the company, website, or individual distributing the file) and whether the file has been tampered with since it was signed. If the file has no valid digital signature, you cannot be certain that the file is actually from the source it claims to be from, or that it has not been tampered with. Signed code is not necessarily safe code, but a digital signature does provide accountability – something that is often missing in a world of anonymously distributed software. 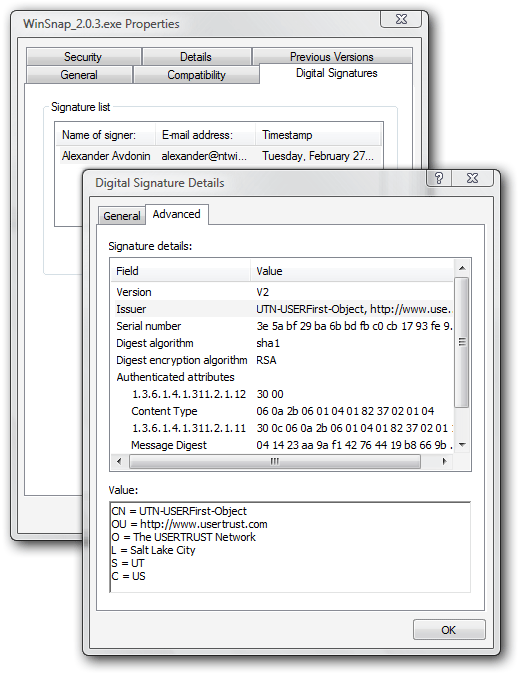 Ensure that you are using the original software: Verify digital signatures! Improvements on the registration mechanism. Fixed bug with underlined letters in the main menu. Several cosmetic changes in UI.